More feasting are in order! Le Méridien Putrajaya is welcoming this New Lunar New Year with creatively curated CNY set menus at Le Mei from 16 January to 24 February 2019. Award-winning Executive Chef Michael Wong and culinary team have created festive set menus along with yee sang menu to usher in all things auspicious for the new year. Le Mei is renowned for fine Cantonese cuisine set in an ambience of old-world Shanghai. From the spacious main dining area to its private dining rooms, the elegant restaurant is set with gold, red, black and cream. Le Mei seats 158 pax in the main dining room and has five private rooms. For this festive 2019, Le Mei is featuring four festive set menus of Spring & Happiness Set, Everlasting Prosperity Set, Wealth & Fortune Set and Emperor Set, price starting from 1888nett to RM8888nett. Each menu comes with a bottle of celebratory wine, champagne or brandy depending on the menu chosen. Chef Michael prepared his yee sang with a twist of fruity sauce. The Salmon Yee Sang with Shredded Treasures & Blackcurrant Plum Dressing is deliciously fresh with slivers of sublime salmon. The blackcurrant plum dressing has just the right balance of tangy fruity note with the moreish plum sauce. Lou Hei, lou hei… shouts of good wishes for the coming new Lunar year is simply a must! For the soup course, the Double Boiled Chicken & Vegetable Soup with Fish Maw & Sun-Dried Scallops is beautifully sweet and savory with much needed earthy comfort notes from the broth. The premium dried seafood are the highlights of the soup along with tender chicken and soft vegetables. More indulgence followed pursuit in the course of Sautéed Lobster with Asparagus in XO Sauce. The crustacean of the sea is always a crowd favorite, especially when prepared well. The lobster tail is cooked just right and super scrumptious in the house made XO sauce along with asparagus. The sauce has that umami note of richness from the long list of ingredients from dried seafood to chili, spices and fresh herbs, all simmered for hours to rendered down the sauce to its prized robust notes. During festive season, many diners will feast on rich and luscious dishes. Chef Wong takes on comfort flavours with his Steamed Cod Fish with Spinach Congee & Wolfberry. The premium cod fish is gently steamed and served on a bed of spinach congee. A generous crispy ginger shreds along with coriander completed the dish. The flavours are delicate and tasty with a luscious oceanic sweetness that made this dish so wonderfully enjoyable. The next course also featured premium seafood. Sautéed Scallops with Asparagus, Wolfberries, Ear Fungus & Macadamia Nuts tasted just as good as it looks. Large diver scallop, plump and juicy, is cooked just right and glazed in a light savory clear sauce. The accompaniment of mini crispy rice basket filled with black wood ear fungus, asparagus, Shimeiji mushrooms, goji berries and macadamia nuts complemented the sweet scallop well. Chef Wong takes a creative spin on the classic fried rice and infused his Cherry Shrimp with Beetroot & Scallops Fried Rice with the pretty tint of beetroot red. The fluffy rice has that wonderful breath of wok. Though one cannot taste the beetroot, the rice is still very tasty with generous bits of seafood and crispy cherry shrimps for textures. Last but not least, Crispy Deep-Fried Chinese Brown Sugar Balls with Sweet Potato as a sweet ending for the festive set menu. Don’t be judge by the plain looking golden balls. These are utterly delicious and addictive. Crispy golden pastry encasing a sweet and creamy filling of nian gao and sweet potato will have one asking for more of this delicious dessert! 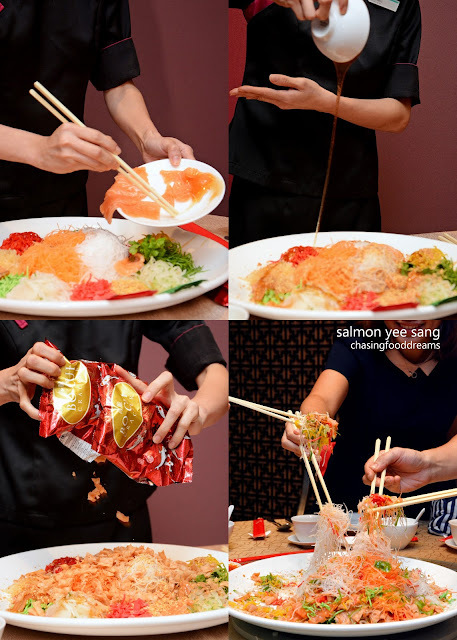 Yee Sang menu starts from RM50nett onwards.